Kariya's application of Western technique to Eastern form is partly the result of her education. She studied in Japan and Italy before getting her bachelor's degree from the University of California, Berkeley, and her master's degree from the San Francisco Art Institute. She points out that decorative art is a field where women have excelled. "It seemed a natural thing to do." Kariya, who lives in Berkeley, began painting furniture in 1976 and shared a studio with Pamela Silin-Palmer, an artist who had begun decorative painting the year before. Silin-Palmer decided to call their joint studio Faunus. "I named it after the Roman word for Pan because a lot of the characters I was portraying were mythological," explains Silin-Palmer. 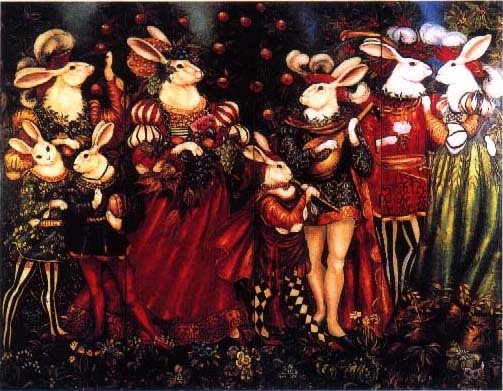 ABOVE: Pamela Silin-Palmer's fanciful autumn pageant of rabbits in Renaissance attire, suggested by a Botticelli painting, exemplifies what she describes as their "iconlike quality." Silin-Palmer, who has since moved to Mendocino, has been influenced by the decorative arts of Europe. Fantasy and wit characterize her painted furniture and murals. She studied art history at Yale, with a specialization in the medieval and early Renaissance periods, but insists that most of her training came from living in Florence and southern France, studying the painting and the decorative arts of these regions, and teaching herself the necessary skills. "In Europe," she says, "there isn't as great a division between fine art and decoration." She cites Botticelli and Uccello as having affected her dramatic compositions and lighting. For example, an autumn festival scene by Botticelli has inspired murals and screens that depict Renaissance celebrations with rabbits in fancy dress impersonating maidens, musicians and courtiers. "I use rabbits because they have this iconlike quality and you can project onto their faces," says Silin-Palmer with a laugh. "And they have these incredible ears, which serve the horizontal or diagonal in composition." She has painted a variety of furniture with such animals as geese, sheep and pigs in Renaissance costume, and notes that animals in human attire have been a consistent motif in the history of decorative arts.